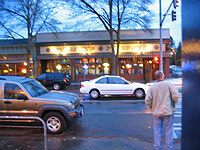 Murphy's is a traditional Irish Pub located on 45th Street in Wallingford. It's a clean and attractive place. Plenty of seating at the large, attractive bar. Or grab a seat at a table or the seating area by the fireplace. There are 18 draughts on tap, including 3 stouts (Guiness [of course], Murphys [not home brewed] and Beamish) and local favs. There are always 2 cask conditioned beers being pulled from the 'engine'. If that doesn't suite your needs there are a good selection of bottles, a few wines, and well drinks. The menu is also quite good for pub grub. I've indulged on the fish n chips and they were excellent. The pub has periodic live Irish music, a jukebox and darts. The atmosphere is pretty laid back. Although smoking is allowed I didn't find it overwhelming (good ventilation system!). If you're in the Wallingford area, do yourself a favor and stop by Murphy's for a pint (or two!) and enjoy.